Let's Take a Step Together to a World Without Cancer! Hi! Chris Zavadowski here! Several years ago my Dad, Rich Zavadowski, was diagnosed with a very rare, very aggressive lymphoma (called peripheral t-cell lymphoma, unspecified). Unfortunately, because this type of blood cancer is so rare, doctors around the world simply don't know enough for effective, standardized treatment. It was a scary time, because four out of five people who get his cancer die within five years (many much sooner). But the good news is, my Dad was accepted into a research protocol at the NIH's National Cancer Institute. And because of the research my Dad participated in, not only was he part of helping doctor's move one step closer to a cure, but as of March 13, 2014, his doctors declared him CURED! "CURED!" = The word every cancer patient wants to hear. "CURED!" = The word MY own dad, Richard A. Zavadowski, finally heard from his NIH lymphoma doctors. Almost 6 years after the diagnosis of his very rare, very aggressive blood cancer (a cancer that still has NO standard effective treatment), the scans were done. No more "remission". No more "cancer-free". Just annual blood work and "CURED!" And this year - we celebrate his TEN YEAR ANNIVERSARY of being cancer-free! Imagine hearing your dad has a cancer that kills 4 out of 5 people who get it. A cancer that still has no standard effective treatment. Then imagine you get to hear the blessed word we heard this year. Fact is, not many people who get what my dad had get to hear the great news we just did (yet). Thanks to amazing cancer research that WORKS (support it at on this page!) and amazing medical care, and amazing family & friends...progress is being made! We have several other amazing cancer survivors on our team, and unfortunately also have lost team members to this terrible disease so our work isn't done. Honestly, we've all been touched my cancer in some way, and truth is, the fight against cancer is still raging on. Which is why we're asking for YOUR help to make sure this valuable research continues, and to celebrate this important milestone for our family and friends! That's why I'm heavily involved with "Light the Night", the Leukemia & Lymphoma Society's annual evening walk and fundraising event to pay tribute and bring hope to those battling cancer. This year, I have another big goal and need YOUR help to reach it and save lives! For the last seven years, having raised over $194,000, we have been one of the top family & friends team for our entire Washingon DC region, and this year, with your help, we're doing it again -- and joining in with hundreds of thousands of others around the globe to raise funds for lifesaving research and patient services! Please donate on this page by clicking "Donate Now" on the right-hand side. ANY amount makes a difference, and you'll join hundreds of thousands of people supporting this all-important event! Plus if you are around October 20...we'd love to have you join us for the DC Walk too! Kind in mind, LLS funded advances are helping patients beyond those for whom they were originally developed, including people with solid tumors and auto-immune diseases. In the past decade, nearly 50% (19 out of 39) of the cancer drugs approved by the FDA were approved as treatments for blood cancer patients. Twelve are already approved for people beyond those for whom they were first developed. With your help, we are saving lives. Remember, we all know someone who has been affected by cancer. With "Light the Night", it's our chance to "walk the talk" and make a difference. "Thanks for everything you do for this cause and for so many other people, Chris!" "This year our dear friend Alicia lost her father, Donald Henzi to lung cancer. We will be missing the walk this year as we will be celebrating Don's life with her family and friends. Love, -robin and Kelley- "
"Every dollar makes a difference! Thank you for sharing your Light the Night event. I will definitely spread the word. Elizabeth was a neighbor across the street with kids that were my kids ages. I miss her dearly and am proud to join your cause. 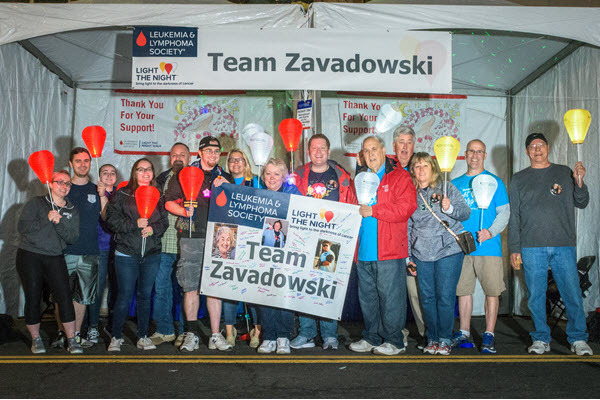 Thank you "Light the Night" and Chris Zavadowski <3 "
"Thanks for your dedication to such a worthy cause, Chris!" "Thanks Chris for everything you do for this cause!" "Thanks for all your hard work fighting this awful disease!"